Car shipping may be a viable option for getting a vehicle across the ocean. Car shipping refers to the transportation of vehicles from one location to another, in a manner that does not involve towing or using the car itself as the primary mode of travel. This is most often done by truck, train, or ship. Car shipping is needed when more than one vehicle is required to be transported to a particular location, or the final destination is overseas. Price, quality and reliability are some of the biggest concerns owners may have when they have a need for vehicle shipping. There are a number of different factors that could substantially influence car shipping costs. The major ones include the distance, method and speed of the shipment. Other factors, such as international duties, may also add to the cost of the service, depending on the vehicle's final destination. The most expensive, and often the most time consuming, way of shipping a vehicle is by ship. This may, however, be the only option in some situations. There are many different providers who offer car shipping. Some shippers will likely have better rates, or better terms, than others. Those wanting the best price may find it to their advantage to check with several different shippers. Some may also be willing to bargain, which could result in a further discount. Some shippers may try to add on hidden fees not included in the actual shipping charges, so it is important to ask for a bottom-line price quote before sending the vehicle. Those who want to ship a car overseas should also check with the destination to make sure the vehicle will meet local vehicle requirements. In addition to the duty taxes, there may also be other charges, such as port charges and storage charges, if the vehicle is not picked up immediately. All these factors could make car shipping more expensive than selling the vehicle and buying another vehicle in the destination country. As with any type of transportation-related matter, there are a number of other concerns that need to be taken into account as well. Damage is a big concern. Car insurance will likely not cover damage to an idle vehicle being shipped. 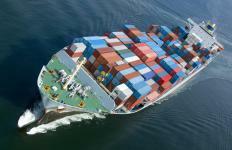 Therefore, taking out a shipping insurance plan may be the best alternative. Another major concern, especially if shipping overseas, is theft. The laws, or security, in the destination country may not be as thorough as they were in the country of origin. In addition, many containers shipped overseas are often delayed because of ocean conditions or governmental red tape. If time is a major factor, this could become a big concern. What is a Sea Lane? What Is a Contract Carrier? How do I get the Best Car Shipping Quote? How do I Ship a Car?